This graph shows a ranking of best-paid musicians worldwide between June 2017 and June 2018. U2 came first with an income of 118 million US dollars, followed by Coldplay and Ed Sheeran. Here you can find a Billboard ranking of highest-paid musicians in the United States (ranked by their U.S. earnings only). Although the music industry elite consists of a relatively small circle of individuals, there are many ways in which to rank the best, the most popular, the richest or the highest paid musical artists in the United States, according to different criteria. 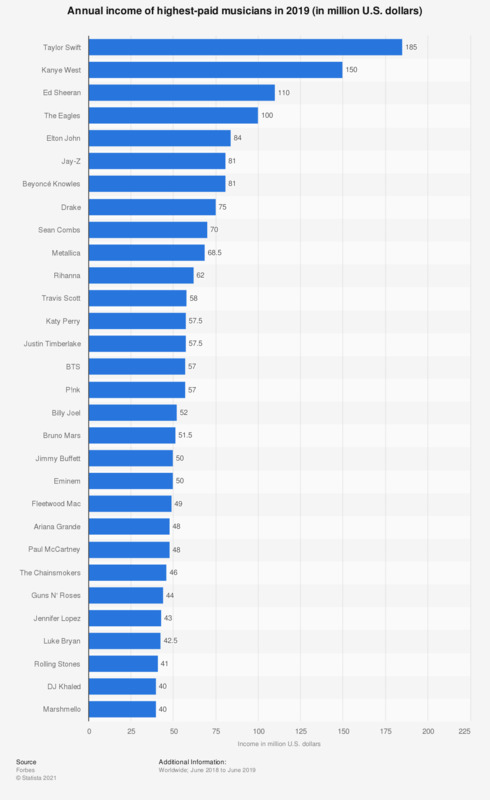 As of 2018 the highest earning female musician was Katy Perry, followed closely by Taylor Swift. Another way in which to test popularity is to look at sales of concert tickets. In 2017, U2 had the most successful music tour in North America, with some 1.5 million tickets sold. In the top five of most successful tours the group was joined by Garth Brooks, Metallica and Luke Bryan. Garth Brooks also featured among the highest earning country musicians of 2018, however lost out to Luke Bryan who topped the ranking with an annual income of 52 million dollars. The source explains that the income of each of the celebrities is an estimate, including ticket sales, royalties for recorded music and publishing, merchandise sales, endorsement deals and other business ventures and reflects pretax income before deducting fees for agents, managers and lawyers. The totals were compiled with the help of data from Pollstar, RIAA, Nielsen SoundScan, managers, lawyers and many of the artists themselves.